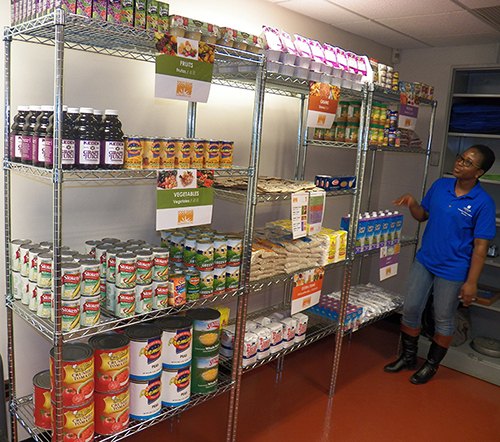 The Lehman College Food Bank opened in 2017. Photo courtesy of Lehman College. “To be clear, this is Suzette’s baby,” says Assistant Director of Campus Life (CL) David Charcape of CL’s Associate Director Suzette Ramsundar. The program Ramsundar fostered is the Lehman Food Bank. “She has done a lot to make this program a success,” Charcape said. As Ramsundar tells it, the idea came to her at work. Hungry students would stop by her office and ask if she had any snacks, especially in the afternoons and evenings. She started keeping energy bars and other snacks in the cubby above her desk to give to anyone who asked. From these seeds, the food bank was born. From left to right: Shovaine Singh, Student Coordinator for Lehman Food Bank; David Charcape, Assistant Director of Campus Life; Suzette Ramsundar, Associate Director of Campus Life and Coordinator of the H.H.L. Leadership Development Center; Lilian Yang, Graduate Assistant of the H.H.L. Leadership Development Center. Photo by Leonel Henriquez. The food bank celebrated its one-year anniversary on March 29. It runs on a volunteer staff of three and is open Mondays, Wednesdays and Thursdays from 10 a.m. to 5 p.m. in room 120 of the Student Life Building. It is only for students and currently serves about 40 appointments per week. Lehman alum Dr. Christopher Emdin says, “It is difficult for students to think about doing homework when they are hungry and concerned that they have little or no food at home.” This concern is double in the case of adult students at Lehman. The recent purchase of a refrigerator allows the pantry to expand beyond canned goods and dry items. It now keeps some perishables, as well as fruits and vegetables, most of which come from a partnership with Corbin Hills to supply fresh locally-grown produce. Lehman alum Carlos Ortiz, now with Goya, reached out and secured a pledge of a 14,000 pound food donation.